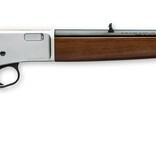 BROWNING BL-22 22 LR SATIN NICKEL - Corlane Sporting Goods Ltd. The Browning BL-22 is in a class by itself. Sure, there are other lever-action 22 rimfire rifles available, but no other has the features, reliability, quality and accuracy of the BL-22. Speaking of features, the highlight of the BL-22 is the short 33° lever throw that makes cycling faster for adults and easier for younger shooters. The easy to load tubular magazine holds any combination of 22 short, long and long rifle ammunition, all of which are on the menu for the BL-22. Unlike some 22 rifles, the BL-22 features quality that rivals other Browning firearms.